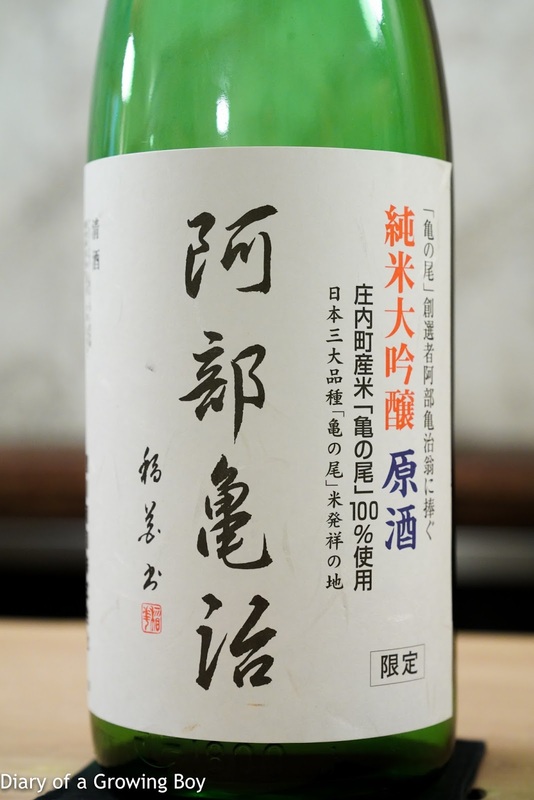 Yoshinosugi no Tarusake (吉杉野の樽酒) - seimaibuai (精米歩合) of 70% and Sake Meter Value of 0. The nose showed fermented flavors, and actually delivered strong notes of lychees. Slightly dry on the attack, but softened mid-palate to become mild and elegant. 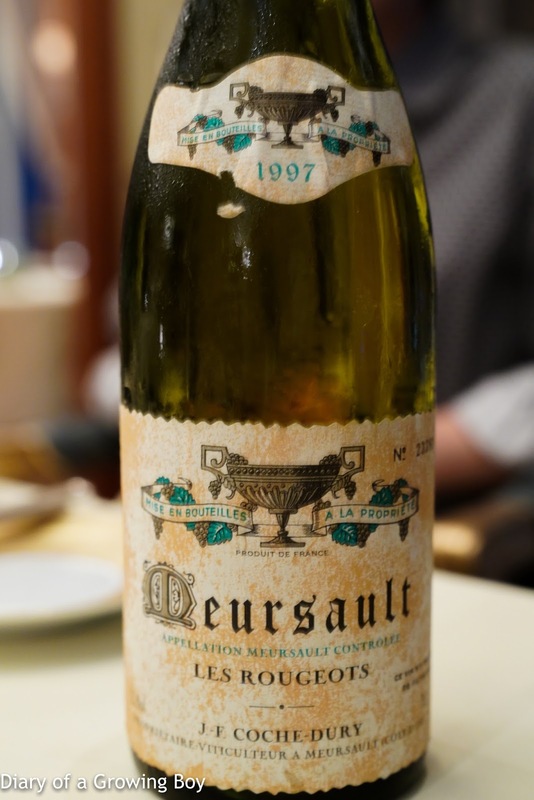 1997 Coche-Dury Meursault Les Rougeots - popped and poured. Beautiful right off the bat, with a big, toasty nose. Attack slightly on the acidic side, but very smooth and elegant on the palate. Lemon citrus notes. Never dipped from the plateau the whole time. 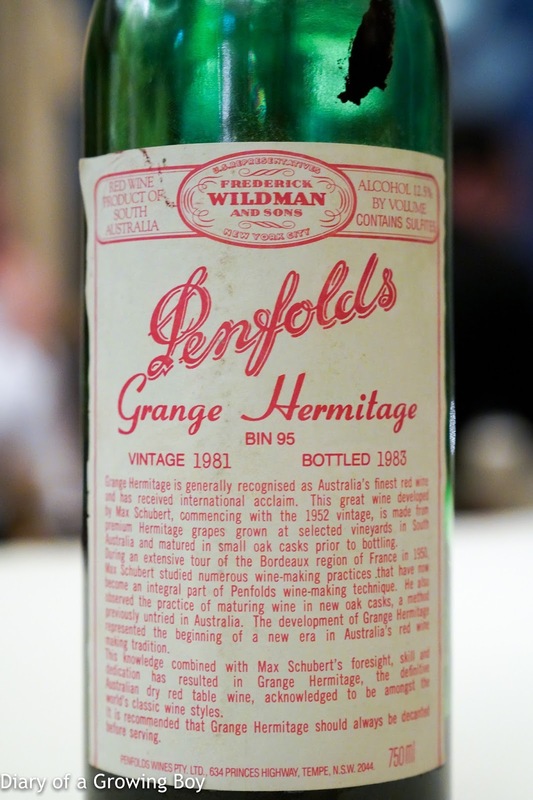 1981 Penfolds Grange - served about 2 hours after opening without decanting. Nose very minty, sweet, lots of coconut, tropical spices, and fragrant woodsy notes. Even after nearly 40 years, the alcohol is still apparently in the nose... with a hint of sharpness. Overall, though, a beautiful wine... and exactly what you would want from an old Grange... which is to say that the tannins and alcohol have softened with age, but the wine was still youthful and lively. 2001 Sassicaia - pretty smoky, fragrant, with cedar notes. Still alcoholic with some fruit, and still pretty tannic. Later on this fell apart in the glass, and there was nothing but smoke. 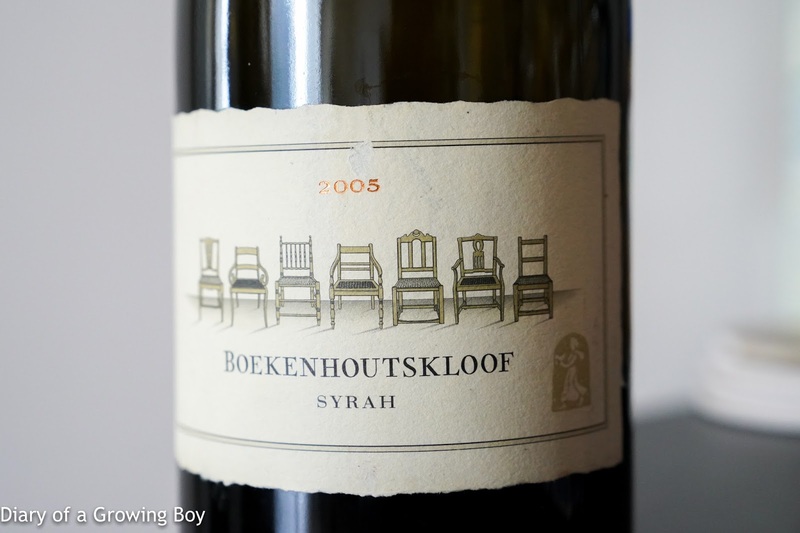 2005 Boekenhoutskloof Syrah - served 40 minutes after opening. A little hot and alcoholic, but still reasonably sweet, with a hint of dustiness on the nose. After 1 hour the pungency faded a little, and the nose softened up a little. Sweet, ripe fruit, with some dried herbs and woodsy notes. 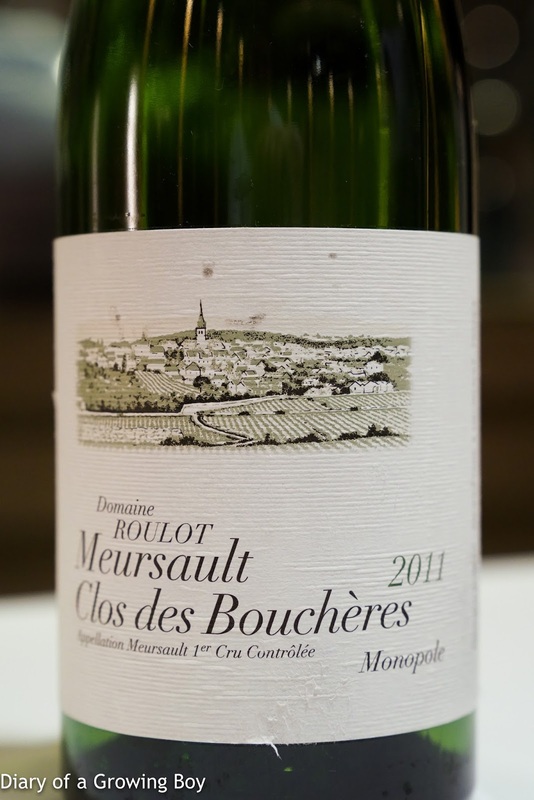 2011 Roulot Meursault 1er Cru Clos des Bouchères - lean, flinty, with classic toasty notes. After 2½ hours it started to open up, and the finish became more refined. Needs time both in the cellar as well as after opening. 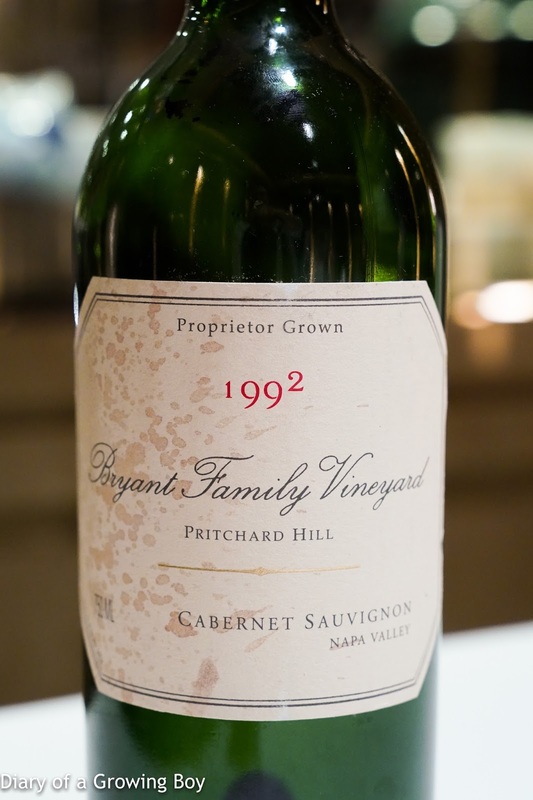 1992 Bryant Family - served 1½ hours after opening. Beautiful, so fragrant. Smoky and jammy at the same time, with cedar notes. So well integrated, so smooth on the palate. Wouldn't have pegged it as a Californian in a blind tasting. 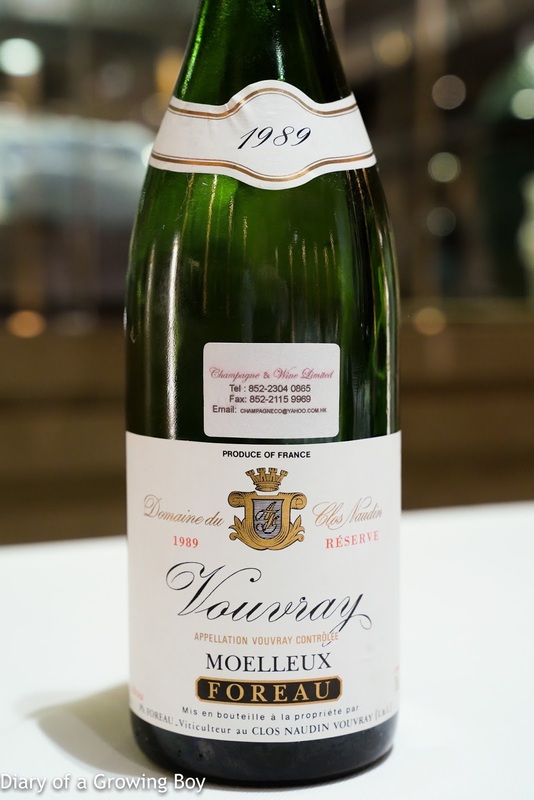 1989 Clos Naudin Vouvray Moelleux Réserve - notes of acetone for sure, with a whiff of straw. Orange blossom, honey, pollen. Reasonably sweet on the palate. 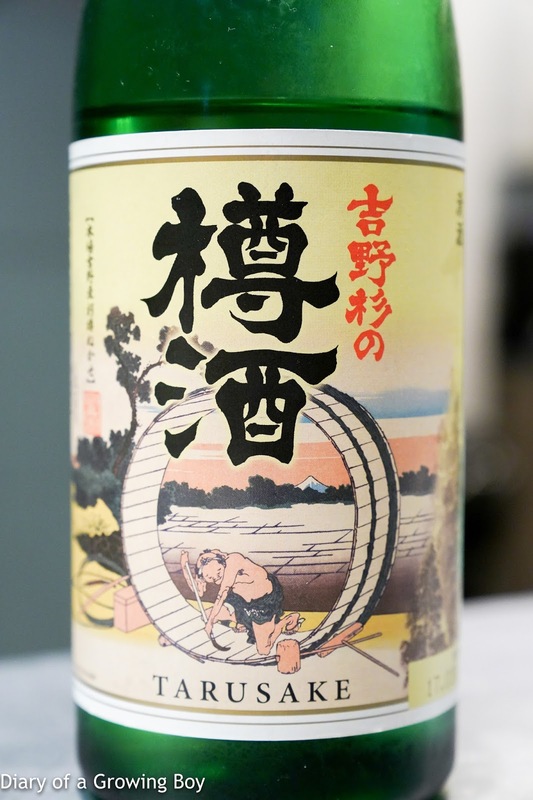 Odayaka Junmai Ginjo Unfiltered Unpasteurized (穏 純米吟醸 うすじごり 生), 2017 - seimaibuai (精米歩合) of 60%. Served at 11°C. Very much like Shanghainese fermented rice (酒釀), slightly hot and alcoholic, and very fruity. 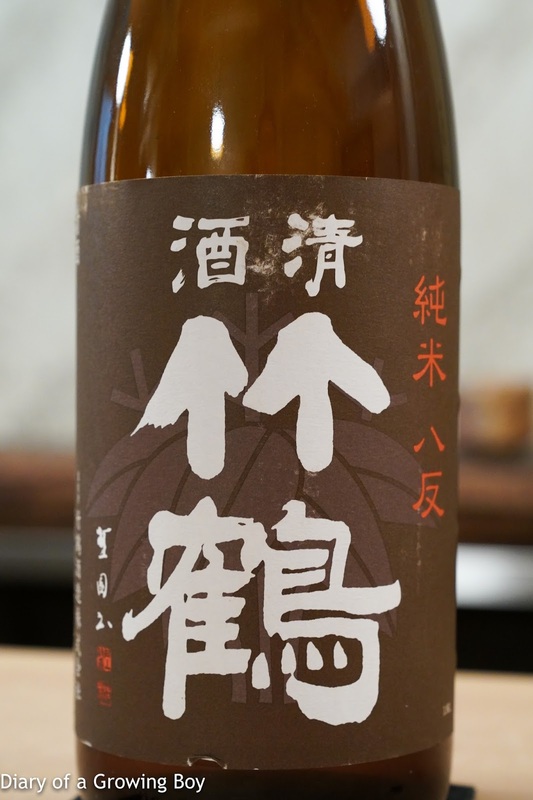 Ryu Bizen Omachi Junmai Nama (隆 備前雄町 純米 生), 2017 - seimaibuai (精米歩合) of 60%. Sake meter value (日本酒度) of +7. Served at 14°C. Dry on the palate, and gradually builds up to a long and strong finish. 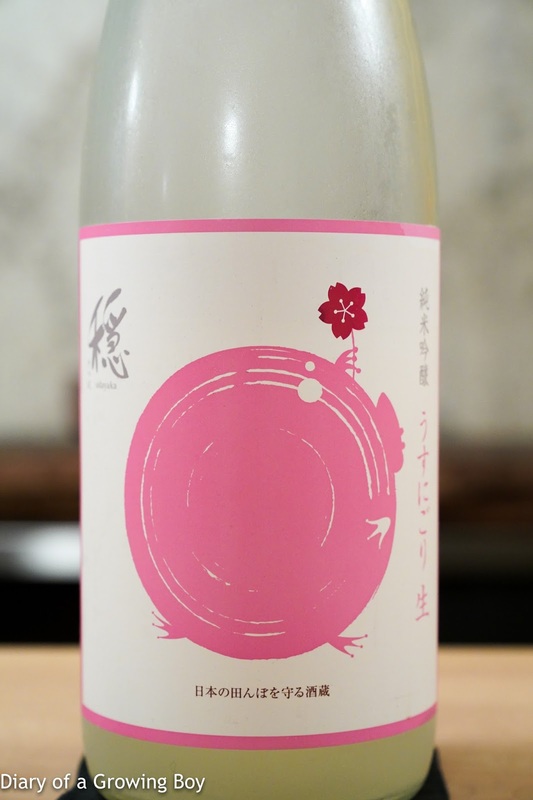 Suginishiki Natural Kimoto Junmai (杉錦 自然醸造 生酛純米), 2016 - Sake meter value (日本酒度) of -11. Served at 18°C. In addition to the sweetness we also have surprisingly high acidity together. 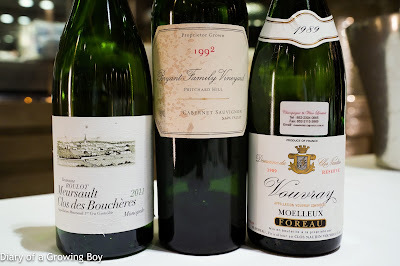 More rounded on the palate, and very aromatic. 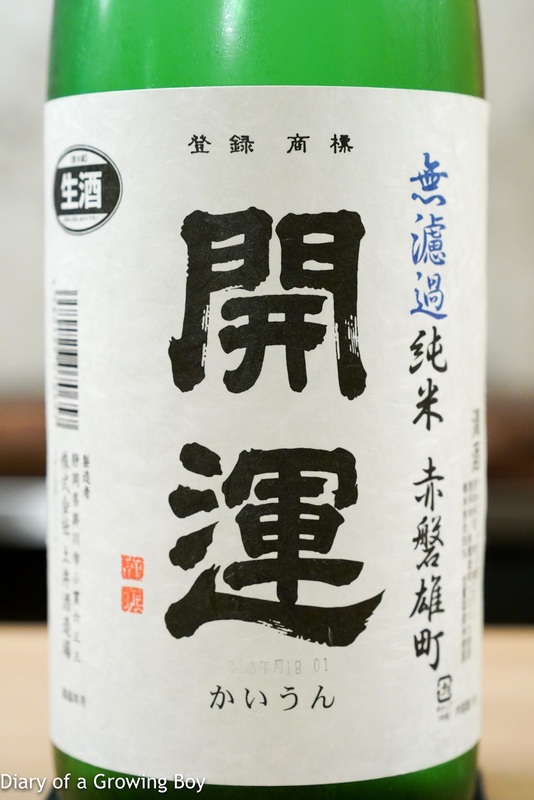 Kaiun Junmai Unfiltered Unpasteurized (開運 無濾過純米 生), 2017 - seimaibuai (精米歩合) of 55%. Served at 13°C. Sweet on the attack, then spicy and dry in the middle. Very rounded on the palate, with some fermented rice in the nose. 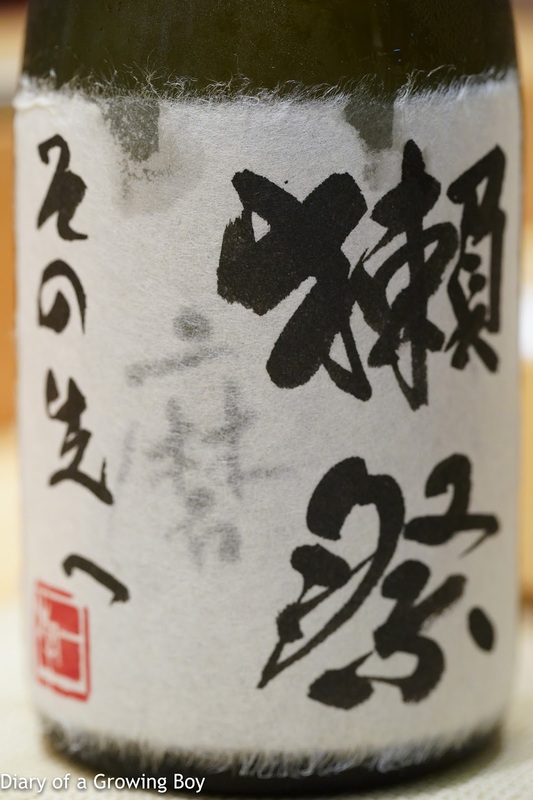 Abe Kameji Junmai Daiginjo Unpasteurized (阿部亀治 純米大吟醸 生), 2016 - seimaibuai (精米歩合) of 40%. Sake meter value (日本酒度) of +5. Served at 43°C. Warm and comforting, with some acidity. 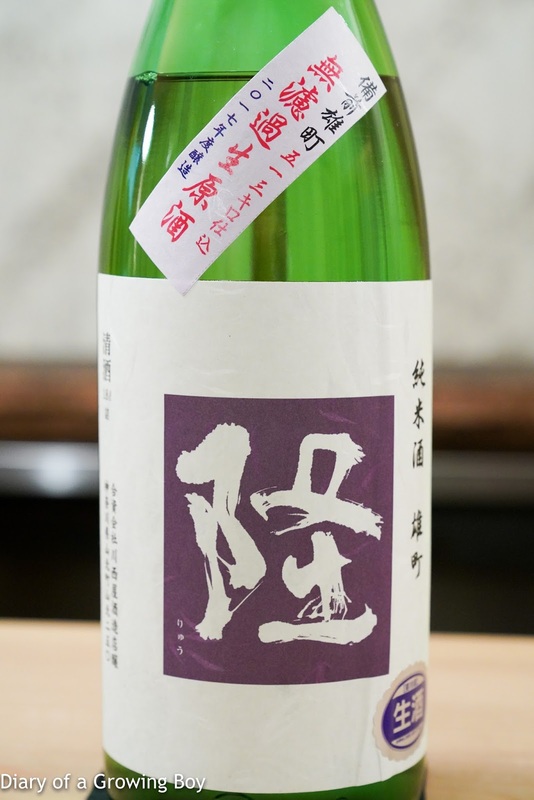 Tamagawa Gohyakumangoku Yamahai Junmai Unfiltered Unpasteurized (玉川 五百万石 山廃純米 無濾過 生), 27BY - seimaibuai (精米歩合) of 66%. Served at 17°C. 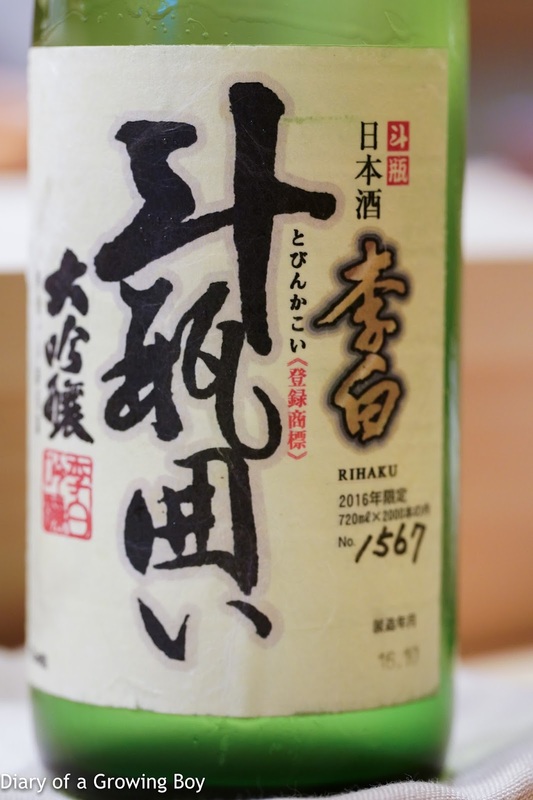 Aged for 1 year at room temperature at the brewery, then aged a further 2 years by Goshima-san. Nose was a little oxidized like Chinese yellow wine, showing savory notes like soy sauce. On the palate almost some coffee notes. 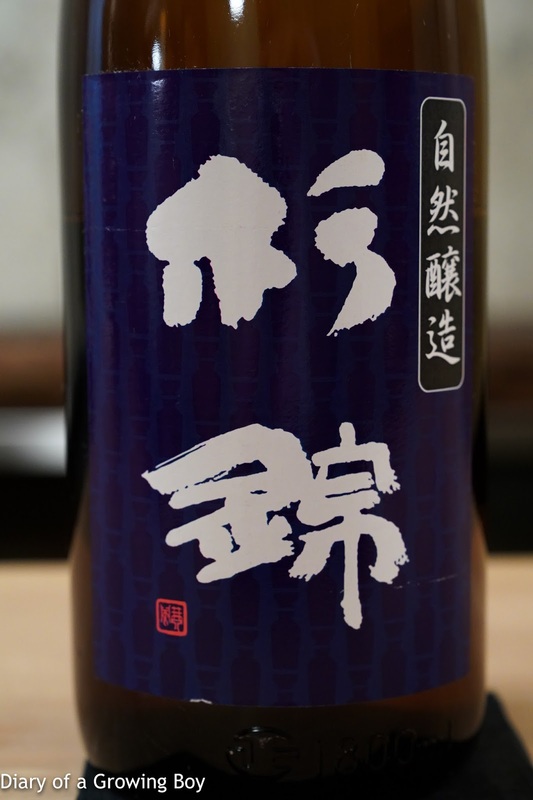 Taketsuru Junmai Hattan (竹鶴 純米 八反), 26BY - seimaibuai 65%. Served at 47°C. Showing a darker color. Very dry on the palate, oxidized and savory. 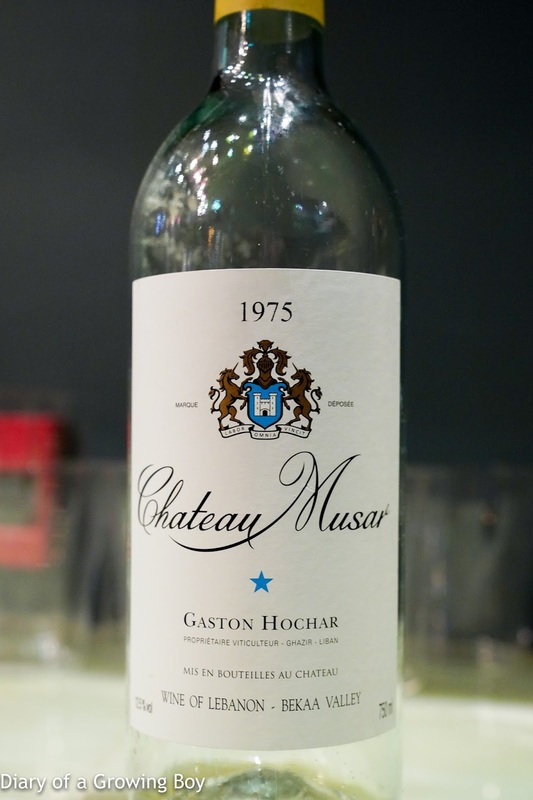 1975 Chateau Musar Blanc - obviously aged and oxidized when one looks at the amber color. Caramelized nose with a little acetone and plenty of marmalade. A little hot and alcoholic. A lovely treat. 2007 Pazo Señoráns Selección de Añada - flinty, mineral, a little savory. Toasty. Still some freshness here with lemon citrus. 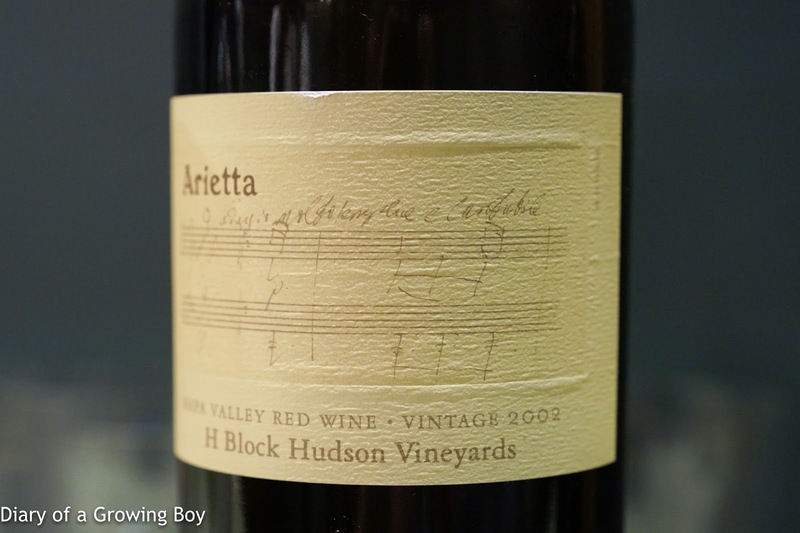 2002 Arietta H Block Hudson Vineyards - decanted for 2 hours prior to serving. Very fragrant nose, a little floral, woodsy, almost tropical with exotic spices, coconut butter. Absolutely beautiful after 3 hours in decanter. Silky smooth but still got the concentration and some tannins. Wow! Dinner at Sushi Saito Hong Kong. 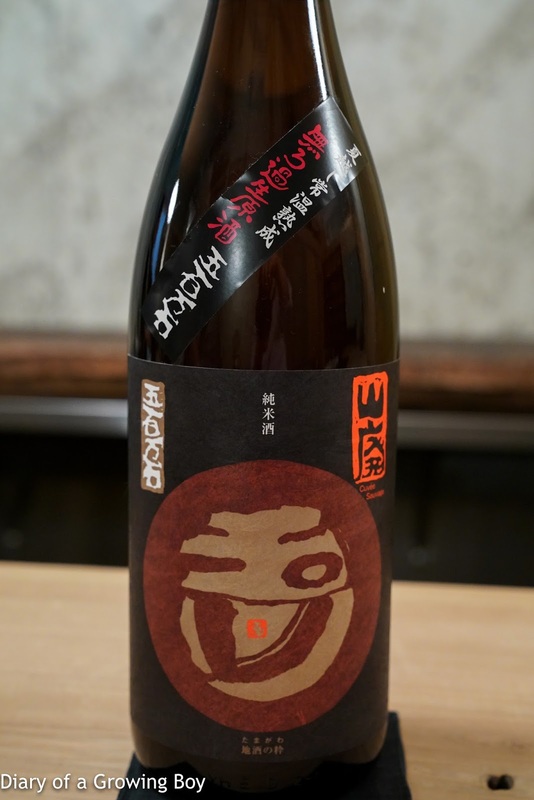 Rihaku Daijinjo Tobingakoi (李白大吟釀斗瓶囲い), BY28 - nice with good fermented rice flavors, with good depth. Very round on the attack, then gradually builds up to a dry finish. After warming up this became a lot more dry, and showing some acetone notes. 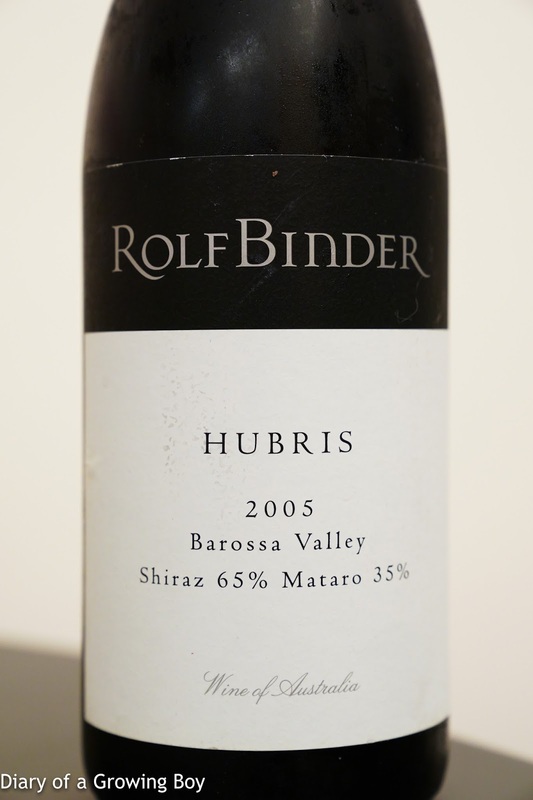 2005 Rolf Binder Hubris - initially too cold when decanted, showing leather notes. Silky smooth on the palate with plenty of concentration and medium length. One hour later showed smoky notes and aromatics emerged, and after warming up the wine packed a real alcoholic punch - displaying vanilla, marzipan, and cedar notes. Two hours later a little chocolate also came out. 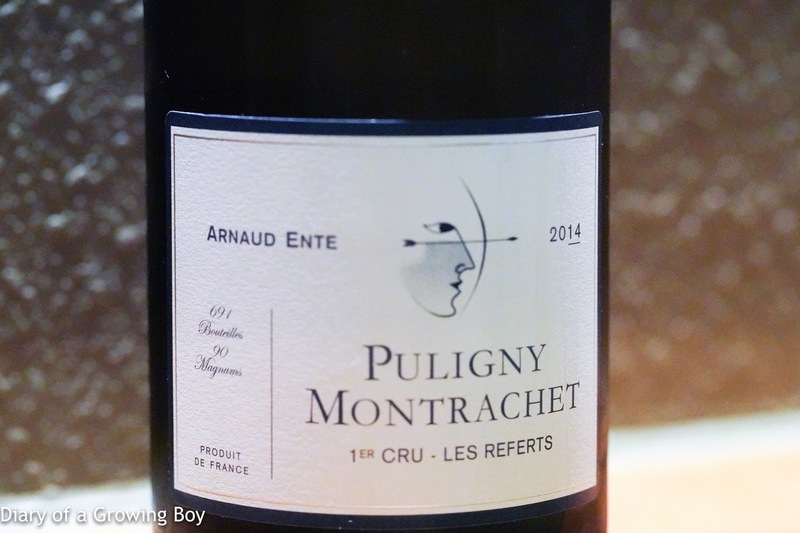 2014 Arnaud Ente Puligny Montrachet 1er Cru Les Referts - nice and toasty, buttery, beautiful. 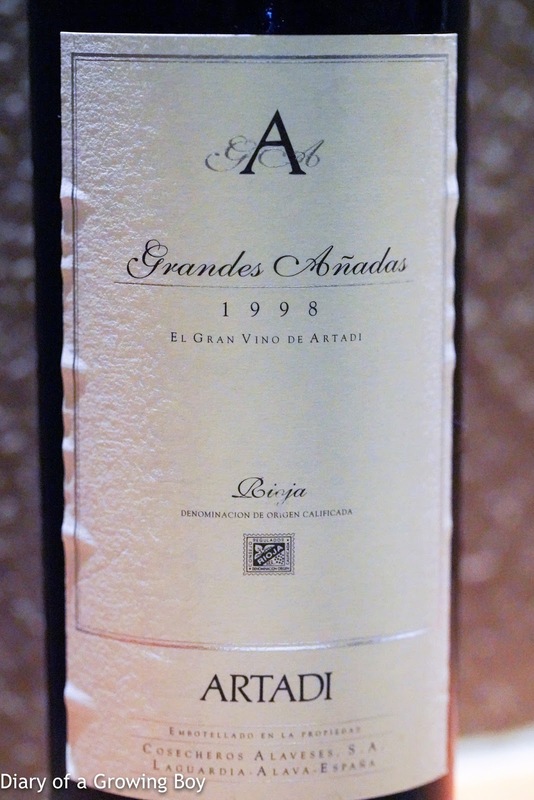 1998 Artadi Grandes Añadas - sweet nose, a little vanilla, a little smoky. Opened up nicely after 1½ hours.